A previously unpublished sketch of the back of a Hampstead terrace by John Constable (1776-1837) drew prolonged bidding at Roseberys' latest picture sale. 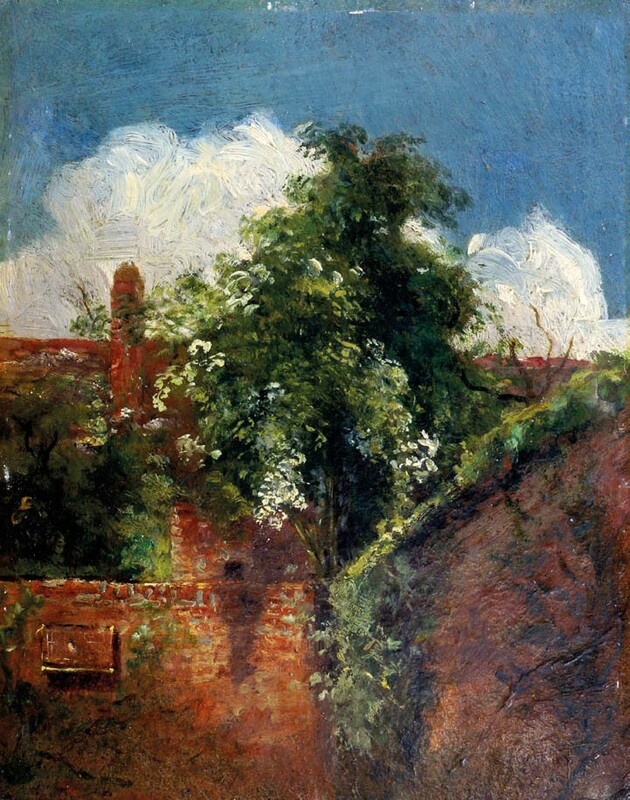 'View towards the back of a terrace of houses, with elder tree' by John Constable (1776-1837) which sold for £305,000 at Roseberys. Offered at the auction today in West Norwood, south London, the bidding opened at £20,000 but, with the price rising in increments of £5000, it was quickly taken well beyond the £30,000 top estimate. It was eventually knocked down to the room bidder at £305,000, who saw off strong interest from two separate parties on the phone. The picture was a small oil on board which related closely a number of similar works made by Constable in c.1821-2. The artist and his young family first took lodgings in Hampstead in 1819 where, for two consecutive summers in 1821 and 1822, he rented a house at 2 Lower Terrace, close to the edge of Hampstead Heath. The 7 x 5.5in (18 x 14cm) ‘sketch’ was titled View towards the back of a Terrace of Houses with Elder tree and came to auction with provenance to the former US ambassador to the UK, John Hay Whitney (1904-82). Following its consignment, the auctioneers spent four months researching the picture and had its authenticity confirmed by Anne Lyles, former curator of 18th and 19th century British art at Tate Britain, who also helped with the cataloguing. She identified the picture at Roseberys as in keeping with two works once owned by the artist’s daughter Isabel Constable (who was born at the house in Hampstead in 1822). Like the current work, they were both painted on millboard, which Constable had first started using around 10 years earlier for his outdoor oil sketches made in Suffolk, Surrey and the Midlands. Indeed, the picture at Roseberys may well have also once belonged to Isabel Constable, who later divided her collection of more than 30 oil paintings by her father between her favourite nieces, nephews and friends. While the exact location of this study could not be identified, the depiction of an elder tree was not unusual. It was one of Constable’s favourite trees and, according to the catalogue, “he regarded it as possessing overtones of melancholy”.